Hunnewell School borders the recently rebuilt Wellesley Free Library on one side and the Fuller Brook Path on the other, which many students use to walk to school. The Brook Path begins by the Nehoiden Golf Course, which is located across from Wellesley College and is a nine hole course open to town residents for membership and is also popular sledding destination among neighborhood kids and families during the winter. The path itself follows the brook and brings you right into downtown Wellesley or all the way to the Wellesley High School track and is a great place for walking or jogging and is very pet friendly. There are three private schools also in the area; The Tenacre County Day School- the campus of which is also a popular summer camp. 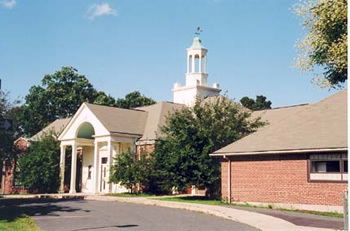 The Dana Hall School is a prestigious all girls boarding and day school which has a lovely campus that includes tennis courts and horse stables/lessons which are popular with the kids. Neighborhood residents also enjoy the beautiful Wellesley College campus and Lake Waban, which has a two mile nature trail around its shore. Other area amenities include the Hunnewell Park Duck Pond and the Wellesley Recycling & Disposal Facility which has become a model for other town and cities around the country. With no town trash pickup, this state of the art facility has become a common meeting place among friends in the community. Search for Homes in the bordering school districts of Sprague and Fiske. Search Homes for Sale in Hunnewell School District. Average Sale Price is $1,592,000.